The most realistic table soccer simulation you can get for VR. 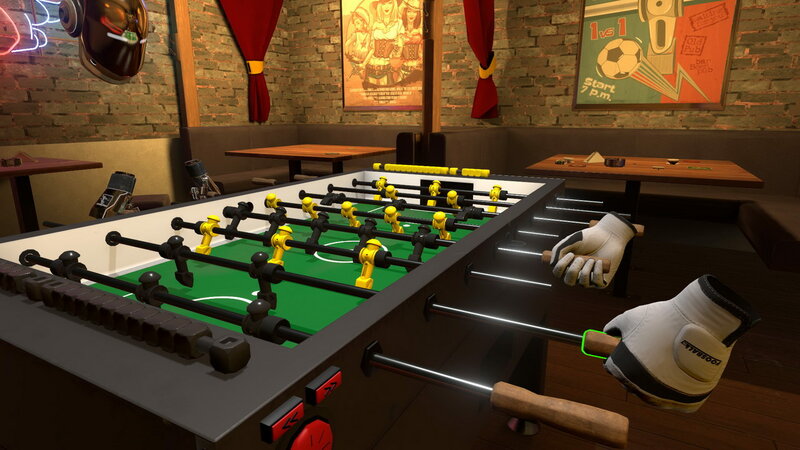 Foosball VR is a virtual reality table football game made and published by Coduar. The player starts in a pub interior with a foosball table that stands in the middle. Access to the in-game menu is provided by pressing a physical button placed on the side of the table. Two flat screen TVs located near the ceiling show the current score of a match. It’s focused on the same sensation you get from playing it in the real world. Standard – the most realistic foosball simulation you can get for VR. Fast and Furious – good for reflex training. The ball can go faster or slower depending on the game pace but it will never do a full stop. Bomberman – you play with a ball that is, in fact, a bomb that explodes in short time intervals. Be sure to send it towards your opponent shortly before it goes off – he might lose some of the players for a couple of seconds. Size Doesn’t Matter – depending on the game score – the ball will grow or shrink when being controlled by a particular player. Wiggle-Wiggle – have you ever wondered how it would be to play the game with rubber-like elastic footballers? Well, now you have a chance to try it out. 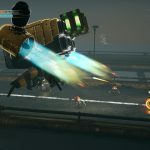 Goalkeeper Wars – this game mode exists in the real world too. Two goalkeepers defend each other shots. Ice Level – the whole foosball field gets frosted and instead of playing with a ball we play with an ice cube! Magnetic – you play a metal ball which is attracted by magnets placed behind the goalkeepers. Pong – are you a fan of the 8-bit microcomputers or early arcade machines? 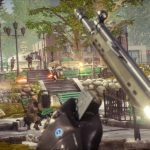 After playing this game mode we are sure you will be. Portals – the ball can teleport from the one side of the table to the other. Play the VR first table football simulator and feel close to real-world foosball sensation or... have fun with exploding balls! It's all up to you. There are four levels of skills of the AI opponent. The player can choose from easy, medium, hard and terminator. By design, the terminator should be an almost unbeatable level of skills. It is only recommended for really experienced and skilled people. The main difference between these standards is based on AI's reaction time, reaction speed, execution speed and range of tricks that it can perform. One of the great features of the full release is game modes such as: Standard Foosball, Bomberman, Pong and so much more! If you're a fan of foosball at all, buy this game. After a couple minutes, I forgot that I was in VR and it felt like I was playing with a real person! The ball behaves precisely as we observe it at a real-world table. The properties of all physical materials were set to values that close the gap between virtual and real world. This game is hands down the best Foosball experience in VR and is a fantastic way to have fun and improve your skills in a way that translates to an actual foosball table.